Ten years ago, we met Carmen, Bridget, Lena and Tibby. Four teenagers, best friends and polar opposites of each other. And yet they were stuck together with a bond so unbreakable nothing could penetrate it. Four books and ten years later, author Ann Brashares has given us the final book in the series, Sisterhood Everlasting. Now women in the last year of their twenties, the Sisterhood has scattered across the United States, and, in Tibby's case, across the world. Carmen is a successful actress in New York, engaged to a guy she doesn't really love, Bridget is living with Eric in San Fransisco where she temps and zooms around the city on her bicycle, Lena is in Rhode Island teaching art classes and occasionally selling her work and Tibby is in living Australia with Brian. Brashares gives us glimpses here and there of what life was like after the girls graduated from college, mostly as a way of illustrating how their bond remained unbroken as they chose their paths after school, but it's the present that's focused on for this final installment. We learn quickly that growing into women has taken its toll on their friendship, and the closeness the Sisterhood of the Traveling Pants once had has faltered somewhat, and although none of them will admit it, they each privately acknowledge that their relationship is not as it once was. For a myriad of reasons, each woman feels lost, wondering why life hasn't quite turned out the way they thought it would. A letter from Tibby, with a plane ticket to Greece arrives in each of their post boxes, and Carmen, Bridget and Lena's spirits are lifted at the though of a reunion in the place that gave them so many happy memories as younger women. But upon arriving in Santorini at Lena's late grandparents' house, it quickly becomes evident that this trip is not going to be the happy reunion they were all hoping for. When a life-changing event takes place, the girls scatter back to their corners of the world, more restless and desolate than ever, questioning themselves, their lives and their friendship. Brashares' writing of these four characters is, as usual, pitch perfect. Each character has their own distinct personality, but the reader will find themselves relating to each one of the girls numerous times throughout the story. 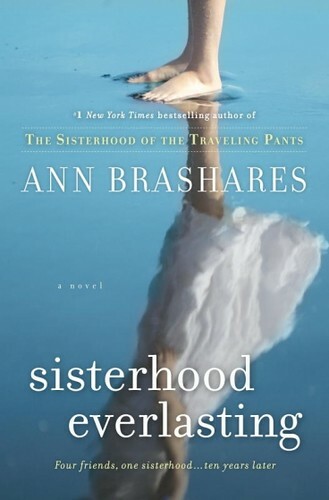 Brashares has such talent for writing female characters - the nuances, the thought patterns and the heart breaking raw emotion conveyed through each character is unbelievably real, and it speaks volumes to Brashares' ability to understand not only her characters, but her audience as well, who have grown up reading about the lives of the Sisterhood. The story flows naturally and while it's seeped in the disappointment and tragedies that come with growing up, the writing is outstanding and affecting. If you're unfamiliar with the Sisterhood of the Traveling Pants series, I highly recommend you get yourself a copy of each book and set aside some weekends to get lost in these beautifully gripping stories. Despite the first three books being Young Adult fiction, they appeal to people of all ages (females in particular, I'm sure), and I know that I'm definitely going to miss reading about these girls. I think it will be a long time before a YA book comes along that is as poignant and enjoyable as these books have been. Oh, I feel naughty now! I always brushed this series off, perhaps due partly to the trailers for the movie, as harmless but not really worthwhile fun, and didn't even consider reading it. Perhaps I soudl reconsider! Hannah, the movie was okay, but the books are definitely better! I really recommend them - my sisters and I loved them. Had not heard of this one! Time to get to the library! Anna, definitely start from the beginning of the series, they're so good!